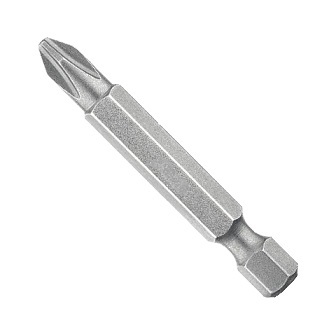 PRODUCT: #2 X 3 inch (2-3/4 inch) Phillips Drive Bit, 1/4 inch Hex Shank, #2 Phillips Size. Price/Each. DESCRIPTION: ISO tempered tough, fracture resistant tips provide extra long life. Easily drives case-hardened and drywall screws.